Adultery has been the seventh sin in the Ten Commandments for two thousand years- except for 1631. In that year the King James Bible was published in London which stated, “thou shalt commit adultery.” Needless to say King Charles I and his bishop were livid; woe to the printer. This was not the first, and certainly not the last time that publishers would make a mistake in the Bible; it happened in almost every edition. What mattered was the extent of the blunder. Replacing a he, for a she might be excusable, but one Bible in the 1600s stated that, “The fool hath said in his heart, there is a God.” It is a rather more extreme mistake. When the ‘Wicked Bible’ was printed, it was only twenty years since the King James original edition had been released. There were many objectives for having a new Bible printed under James’ reign: as a new monarch, the new Bible would be a testament to his leadership; the Puritans were calling for a continued reformation of the church- they were smart and powerful enough not to be ignored; church leaders wanted one clear English Bible that would overshadow the established Genevan Bible that was respected by educated English subjects (it was Shakespeare’s Bible). After seven years of scholarly debate and discussion at Hampton Court, the Bible was ready to be printed in 1611. It is said that Baker bought the rights to the Bible for 3, 500 pounds. He shared the cost of publishing the Bible with at least one rival – Bonham Norton, who was in the publishing business; this partnership would ultimately be his undoing. Why did these men want to publish the Bible? They had a monopoly: this means that any English person or institution that wanted a King James Bible had to buy it from them; a lucrative business in an age of God-fearing subjects. Coupled with this, was the Puritan desire that everyone should have access to God’s word; a good time to make and sell Bibles. 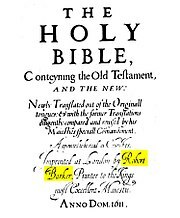 In 1613 Barker decided to re-publish the Bible; possibly with corrections (although some of them remained). Unfortunately there was a problem with Matthew 26:36. Rather than Jesus going with his disciples, the word Judas has been written; yet another blunder by Robert Baker. A copy of this Bible can be found in St. Mary’s Church, Totnes, Devon. During the time between the ‘Judas Bible’ and the ‘Wicked Bible’ Barker raised his prolific nineteen children. One daughter Sarah, married his rival Bonham Norton’s son. But fate would not be kind to Barker. In 1631 he would suffer embarrassment over the ‘Wicked Bible.’ He and Martin Lucas were forced to pay 300 pounds in fines. There are suggestions that the mistake was an attempt at sabotage; possibly by his rival and now relation Bonham Norton. Whatever the reason for the mistake, Baker’s fortune quickly fell. His second wife died the same year the ‘Wicked Bible’ was published. Four years later his son and partner would die, along with another son and daughter- in-law. Norton accused him of taking a bribe. That same year he was put into prison for debts. He would die ten years later in prison; an unfortunate ending to the man who had brought the King James Bible to the world of print. This entry was posted in historical, history and literature, media, politics and tagged Adulterers Bible, Bonham Nortan, Britain, Devon, historical, James I, Judas Bible, King James Bible, Printing Press, Robert Barker, Sinners Bible, Totnes, Wicked Bible. Bookmark the permalink.